When I first began my sport heritage research about a dozen years ago, I was told on repeated occasions – normally by those based in Britain – that sport heritage was strictly an “American” thing. While certainly, at that time, things like sports halls of fame, stadium tours, and the like were more prevalent in the USA, the idea that sport heritage wasn’t really a part of the heritage narrative in Britain seemed farfetched to say the least. Indeed, now it appears that acknowledging, celebrating, and commodifying the many sport heritages of regions, communities, and teams across Britain are a central part of contemporary heritage narratives, particularly in England’s northwest. Earlier this month while attending the Transnational Dialogues in Cultural Heritage in Liverpool (sport heritage in Liverpool is immense and very public, and will receive a dedicated blog post in the coming weeks), I had the opportunity to experience many sites and locations associated with the sporting heritage of the northwest of England. Some of these sites are famous for being famous, as it were, some featured sporting practices that are traditional to the region, and some are more conscious of their touristic role. 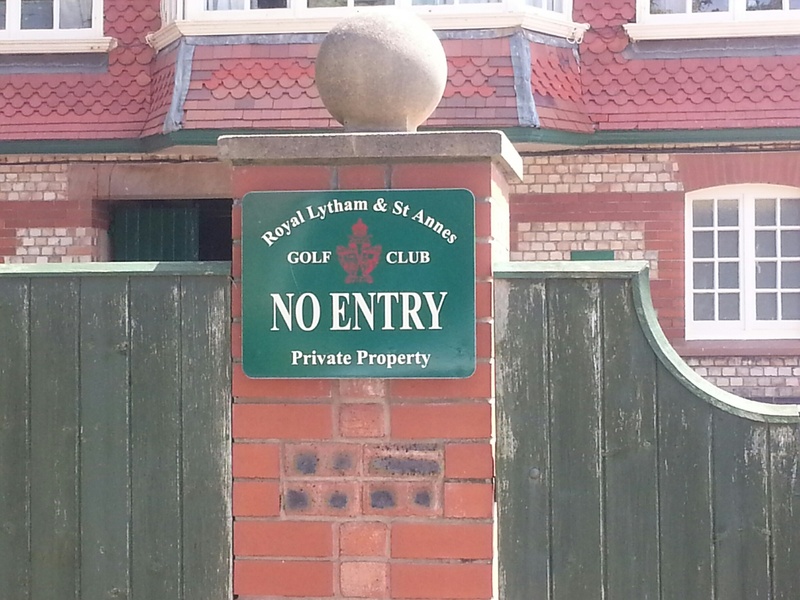 The first site “visited” (in reality, only a quick drive past) was the Royal Lytham & St Annes Golf Club, one of the courses on the (British) Open rotation, having hosted the tournament eleven times and, most recently, in 2012. There isn’t much in the way of public visitation to the site and, had it not been for my local hosts, I probably would never have been able to find the club. I was not the only tourist lurking outside of the club’s main gates but, as the sign below indicates, it’s not really a club that welcomes visitors in any case. Indeed, many sport heritages are not really meant for broad, touristic consumption – or, perhaps, are not self-conscious of a touristic gaze. 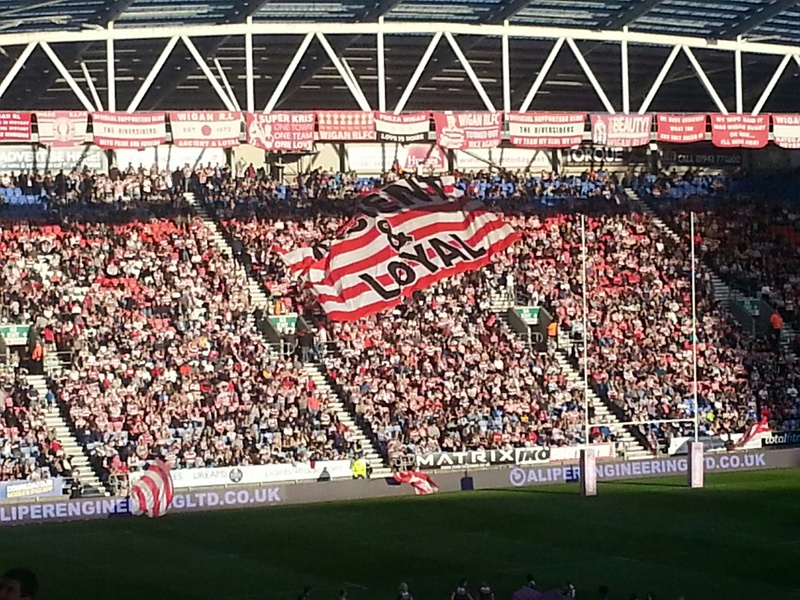 Such was the case when attending a Rugby League match in Wigan. 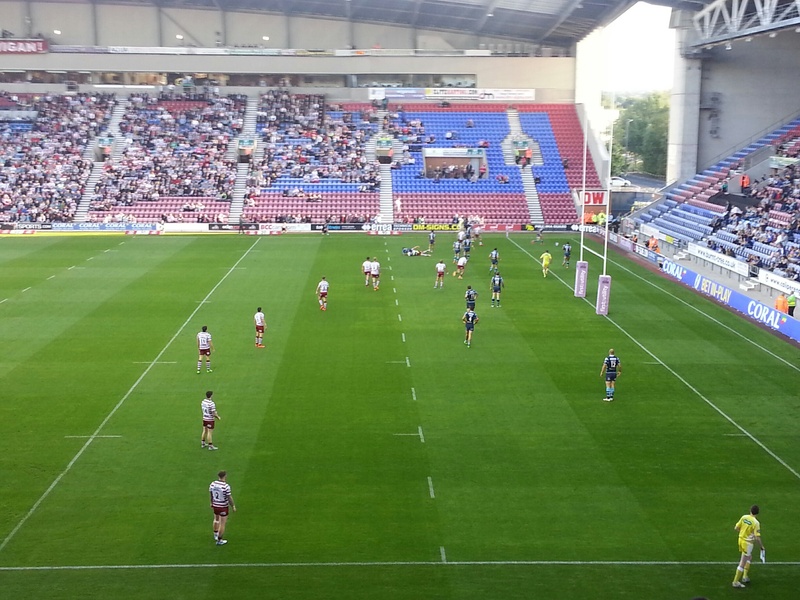 In fact, despite being a sport with a lengthy and distinguished heritage, rugby league has the feel of a sport that is very recent, perhaps as a reaction to making rugby union “more exciting” in the same way that T20 cricket was set up as an antidote to test cricket. However, it is a very traditional sport in England’s northwest and, despite the fact that game presentation (such as the music, etc) had more in common with, say, an NFL or NBA game, there were numerous markers around the stadium indicating the club – and sport’s – history. I suspect I may have been one of the few foreign spectators at the match (won by Wigan over rival Leeds with a last second penalty kick); unlike other sports like football, rugby league hasn’t attracted vast global attention and, as such, the atmosphere at the match was very local and, dare I say, authentic. Another community that appeared to publicly embrace and proudly display their sporting heritage was Preston. 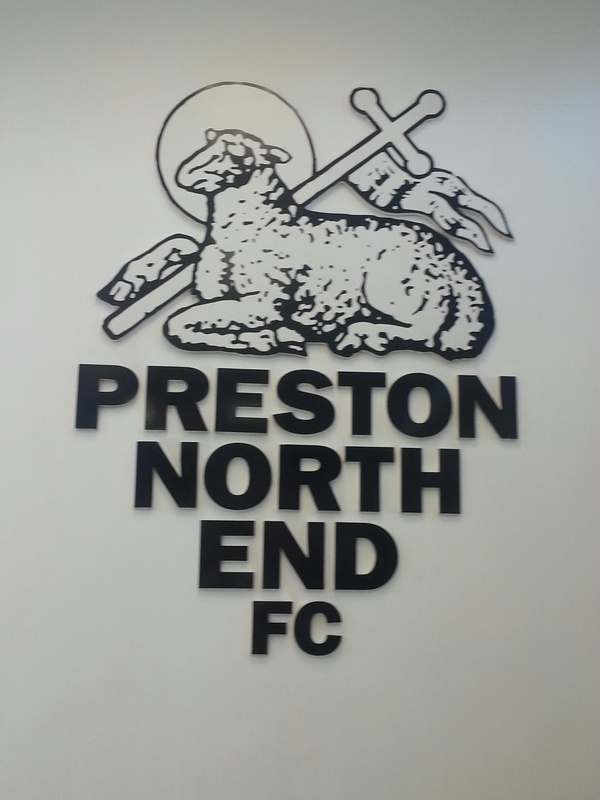 Specifically, reminders of the town’s home football club – Preston North End (or PNE) – and their most famous player, Tom Finney, were present throughout my brief stay. PNE are one of the oldest football clubs in the world, their home stadium, Deepdale, was the oldest football ground still in use and, for many years, the stadium housed the National Football Museum (the museum has since relocated to Manchester). However, for a club that has been in some of the lower divisions of English football for some years, and have not won many major trophies since before the Second World War, the team appears to welcome quite a few visitors, particularly at a well stocked team shop, through a stadium tour, and via various heritage markers across the stadium grounds. For a town like Preston, which appears unlikely to host many tourists, PNE appears to be one of the community’s star attractions. While these examples do not come close to representing the entirety of sport heritages in England’s northwest, they are indicative that sport heritage is not just an “American” thing. Certainly, the role that sport has played in the history, culture, and development of Britain is immense, and it is wonderful to see that many communities – particularly those like Preston – acknowledge the important contemporary role of the sporting past. By Gregory Ramshaw in England, football, golf, heritage, rugby, sport, tourism on July 21, 2015 . 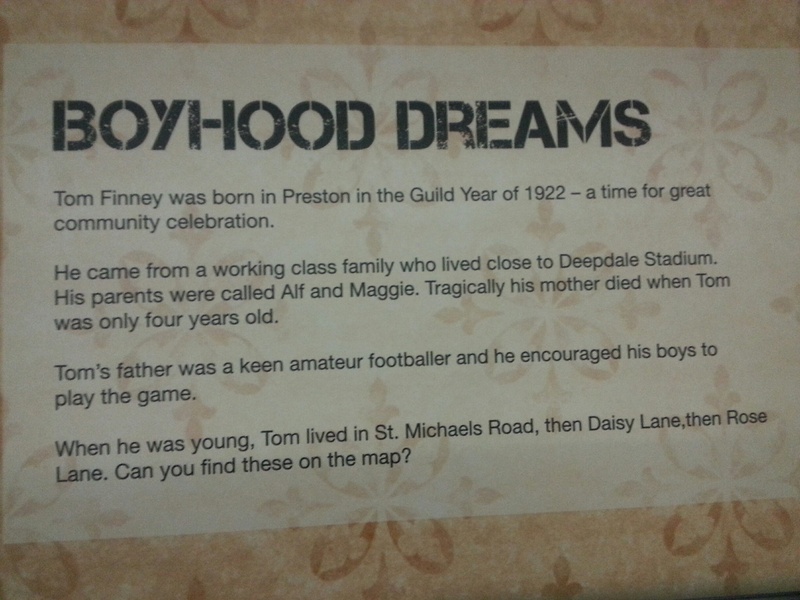 I’m not a PNE supporter, but I did visit the National Football Museum when it was based at Deepdale. It seemed somehow “right” that Preston should house the museum, being the first league champions of English football, and it also enabled the visitor to combine their museum trip with a live game. The museum in Manchester is bigger but the experience has been diminished in my opinion. I think financial considerations – particularly a desire to attract more visitors – was the main reason for the move to Manchester. But, yes, there would probably be something quite special about visiting the museum in Preston. A shame that it had to move.